Son of Pandit S. Ballesh, grandson of Shehnai Samrat Pandit Sanna Bharamanna, Surmani Krishna Ballesh was taken under tutelage by the maestro Ustad Bismillah khan himself at the tender age of 14. A trained vocalist and prodigal Shehnai player, Krishna has performed at many prestigious events. He has also worked with several composers including AR Rahman. 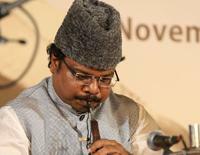 In his young career, he has received numerous awards such as Surmani, Shehnai Ratna and Bhajan Samrat. An engineer from Anna University, this musical prodigy also works with IBM as a software engineer.